She’s the CEO of that amazing company you’ve always dreamed of working for. And she’s looking for a personal assistant with superhuman powers. One who’ll grasp every aspect of the enterprise in a flash, decide what’s important and what’s not, see through walls and read people’s minds. Your PA resume has to show that you’re that candidate. Because of the proven, easy-to-use resume writing tips and tricks I’m about to share with you. A personal assistant resume sample better than 9 out of 10 other resumes. How to write a professional personal assistant resume even if you have no experience. Tips and examples of how to put skills and achievements on a PA resume. How to describe your experience on a resume for personal assistant positions to get any job you want. 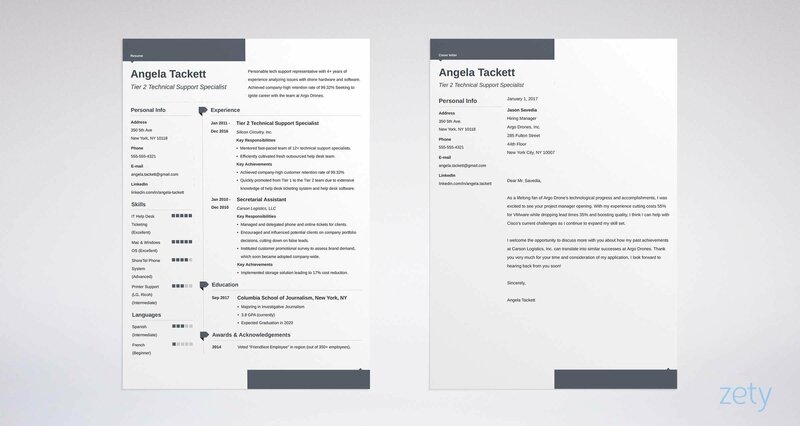 Personal Assistant Resume Sample—See 20+ resume templates and create your resume here. 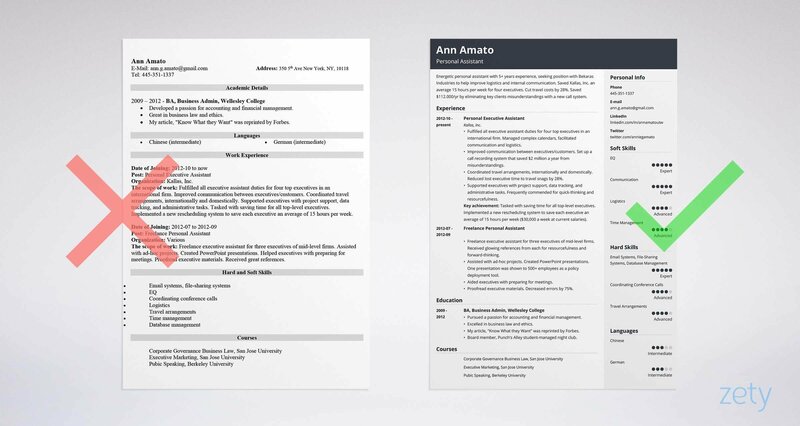 What’s the Best Format for a Personal Assistant Resume? That’s what stands between you and your dream job. Your personal assistant resume is somewhere in the middle of this pile. Statistically speaking, it will get no more than 6 seconds of the recruiter’s attention. Yes, you read that right—no one will read your whole resume. Recruiters and hiring managers will just skim through it looking for the most important info about your career. Serve them what they seek on a silver platter. Pick the trusted reverse-chronological resume format. It highlights the peak of your career. Plus, recruiters are familiar with it and they’ll know where to find what they need to know. Here’s what to include in a reverse-chronological personal assistant resume, from top to bottom. Use clear, legible fonts. (Arial, Tahoma, Calibri, or Open Sans, for instance.) Add white space and big headings to break up the page. Finally, save your professional personal assistant resume in PDF so it won't scramble from one computer to the next. Pro Tip: Double check with the job ad if it’s okay to submit PDF files. Some employers use old-school software to scan resumes—it might choke on PDFs. If such is the case, submit your personal assistant resume in Word. Personal Assistant Resume Objective or Summary? Research has shown that recruiters mostly focus on the top third of your resume. Make the most of this part. Right under your contact information, put a resume objective or a resume summary—a short and sweet paragraph that explains why you’re the perfect candidate. Resume summary gives an outline of your career and highlights your best achievements. It reads like a short version of your personal assistant bio. Use it if you’ve got relevant personal assistant job experience. Resume objective, in turns, discusses what you’ve learned so far and shows how you’d fit in. If you’re writing an entry-level personal assistant resume with little experience, choose the resume objective. The key thing? In your resume objective or summary don’t write about what you want out of the job. Focus on what you have to offer. Let’s see some examples. We’ll start with objectives. English graduate with proven communication, travel planning, and email management skills developed while volunteering at UPenn International Student Exchange Center. Seeking a position as a Personal Assistant to CEO of Acme Inc., to leverage organizational and research skills improving logistics efficiency. Recent graduate seeking a personal assistant role. Do not have much professional experience but I am willing to learn new things to excel at my new job. No one needs that kind of PA.
Time to see two very different personal assistant resume summary examples. Professional, efficient personal assistant with 6+ years experience working for three executives at a large corporate organization. Excellent project management, organization and communication skills. Introduced a time management system and increased the efficiency of the office by 15%. Seeking to use my expertise to help XYZ’s CEO improve communications and efficiency, while cutting costs. That’s the response this kind of summary will bring. Experienced PA skilled in drafting contracts, managing meetings and emails. Wide range of soft and hard office skills. Organized and dependable. Pro Tip: In every professional summary for personal assistant jobs, as well as a PA resume objective, address the company or an individual by name and indicate the exact position you’re targeting. Yes—that means you cannot send one general resume for every application. And that’s the point. You’re a personal assistant. Personalize every resume you send. Most personal assistant job descriptions on a resume read pretty much the same. While it might sound underwhelming and mundane, in fact it’s complex work that requires excellent organization and multitasking skills. Luckily, there’s a way to describe your work history so that it makes your resume stand out from the crowd like Ariana Grande in a Dunkin’ Donuts. In the work experience section of your personal assistant resume, don’t just talk about your past duties. Focus on your achievements. Start with your current or most recent job. Follow it with your previous position and the one before that, and so on. Under each job, add up to 5 bullet points describing your duties and, more importantly, your achievements. Quantify whenever possible. Don’t say you “helped significantly reduce expenses.” Say how much exactly. Numbers pop! At the bottom, add a “Key achievement” subsection where you show off your best win. Last but not least—pick phrases from the job ad, and refer to them in your work experience section. List relevant responsibilities, not every single task you’ve performed. In other words: target your resume. Fulfilled all executive assistant duties for four top executives in an international firm. Managed complex calendars, facilitated communication and logistics. Improved communication between executives/customers. Set up a call recording system that saved $2 million a year from misunderstandings. Supported executives with project support, data tracking, and administrative tasks. Frequently commended for quick-thinking and resourcefulness. Key achievement: Tasked with saving time for all top-level executives. Saved each an average of 15 hours per week, which translates to $30,000 a week at current salaries. Looking for a non-corporate personal assistant job? Here’s an example from a different field. Provide ongoing household management for a busy family with 5 children in an 18.000 sq. ft. home. Manage all calls, collect and sort mail. Maintain daily task list, arrange meetings, and make appointments. Plan and supervise all personal travel arrangements. Key achievement: Identified a solution to consolidate all personal loans, saving $480 monthly and reducing accounting time by ~5 hours a week. Just perfect. Action words, numbers, achievements—all check. The work experience section is the most important part of every personal assistant resume. More often than not, all you have to do in your resume education section is list your highest degree of education. Here’s an example of the best personal assistant resume education section for candidates with no experience. Excelled in Applied Maths coursework. 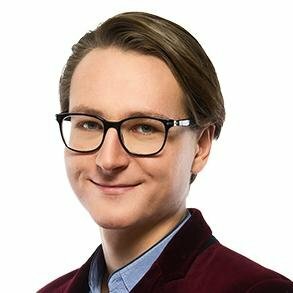 President of the Undergraduate Student Board 2017–2018. Editor-in-chief of the official department blog. Pro Tip: For personal assistant resumes with little work history, move your education section above your work experience. When listing your PA skills on a resume, relevance is key. Don’t include every skill you think you have in random order. Focus on the skills that will be expected of you in a particular job. Remember when I mentioned tailoring a resume? Here it comes again. Start with a spreadsheet that lists all your professional skills. Read the job description carefully. Look for skills-related keywords. Check how many of these are there in your spreadsheet. Quite a few, right? That’s your skills list. Don’t just put the names of your skills. Provide evidence that shows your level of proficiency. Social media management: updated individual and corporate social media channels (Facebook, Twitter, Instagram) with unique content regularly; increased local model’s Instagram followers base from 18.000 to 112.000 in 4 months. Styling: oversaw styling and preparation for 10+ award shows. Tour support: conducted in-depth research of cities and venues, cooperated with photographers in managing behind-the-scenes shoots. Could use a hand with picking the right skills to put on your professional PA resume? Get inspired with our examples below. Pro Tip: Don’t even think of skipping your soft skills. This study shows that modern economy will increasingly reward those candidates who combine technical with soft skills—that means more job opportunities and higher pay. Candidates lie on their resumes and recruiters know that. You can make them actually believe your resume. Add an extra section that provides proof that you’re a valuable candidate. List your unquestionable professional triumphs. Check out these ideas for an additional section on a resume for personal assistant positions. Pro Tip: To add some glam to your PA resume, consider taking an online class or two. You can finish most in a couple of hours without leaving home and they can make a huge difference for your chances of landing that dream job. Can’t showcase any of the above yet? Don’t fret. An entry-level PA resume can still benefit from an extra section. Are cover letters worth it? If you want to double your chances of getting the job—oh yes, they are. That almost half of recruiters won’t even open your personal assistant resume if there’s no cover letter attached. Besides, you can use your PA cover letter to your great advantage. Cover letters can do what even the best resume can’t—they tell a story. And humans love stories a lot more than raw data. Pro Tip: Once you send your personal assistant resume and cover letter, don’t forget to follow up on your application. A well-placed phone call or email can put you top of mind. Personalize every resume you send to match the requirements of the job. Put a personal assistant resume objective or summary at the top. In your work experience section, don’t just list your duties—showcase your achievements! Back up your skills with verifiable proof. Add an extra section for your certifications, awards, additional training, or blogging. All check? I’m keeping my fingers crossed for your interview! Got any more questions? Need further help? Want to chat about writing your resume? That’s great cause I can’t wait to hear your thoughts! Drop me a line in the comments and I’ll get back to you double-quick. How to email a resume to get more job offers? Writing a great resume might not be enough. You have to know how to send it! Check out a sample email to send with a resume, see great resume emailing hacks and get tips from HR pros. Learn the best strategy to send a resume email and start getting more interviews!